why do I grow peonies?…because they’re worth it! On the lot that contains the house that we will tear down, the former owner was quite the gardener and had one peony bush (not sure why there was just one). But, that one bush had the most beautiful blooms earlier in May. We enjoyed a great bouquet for our own house, and clipped a few flowers for the teacher birthdays that came up in May. I am a new fan of peonies! Incidentally, I was in Suzanne Kasler’s office last week, when she received word of being on the Elle Decor list of top designers. She had just sent a bouquet of peonies to Margaret Russell because it is Ms. Russell’s favorite flower! More breath-taking peonies—I’m sooo envious! Love the chairs, too! 6 years ago I too moved into a home with Peonies already in the garden…what a beautiful surprise when I saw them come up for the very first time, I fell in love instantly! and the chairs are stunning! I can smell them! Must be the strong westerly winds here in Kansas today. True to form in Kansas: peonies open and strong winds/storms smash through. Always sad to see the ones that failed to open. Henry Mitchell, the late great Washington Post garden writer loved, luxuriated in peonies and was always quick to point out that when the shouting was over, a perfectly lovely tropical looking foilage plant was left behind. Not such a bad deal. Sarah looks gorgeous! I always wonder whether peonies weather better in or out, cut…in your case I’d be bringing bucketfuls indoors! I’ve successfully kept some (big buds, but yet unopened) in a second fridge I have for a week. Wonderful to pull out that last batch when all else is gone. Fabulous images. Great peonies always remind me of delicately tinted paper or fabric. It’s funny- our peonies are just starting to bloom here. Such happiness they bring! Your photos are wonderfully rich. I’d love to visit your garden, Trish! I should not only plant roses but also Peonies in my garden!! Thank you for your comment on my post and for the tip! You are wonderful! Love you!!! I have some great photos of peony hedges dripping over a front row of lavender…somewhere! Belgium get such a lovely winter chill…can just imagine how gorgeous peonies would be there! Ah lovely, Trish. Yesterday, I finally succumbed as I was afraid they’d be gone from a Thurs. farmer’s market. I deducted $10.00 of stuff from my market basket after I checked that I could make meals the whole week w/out the items. I convinced two women in silent (& then open) debate to do the same thing. One looked about to cry & the other was giving herself massive forehead wrinkles. Everyone was relieved, tension broken. Peony bunches all gone in minutes. (There was a herd o’ peony purchasers after us.) I wasn’t a philosophy & religion undergrad for nothing. I throw myself into the deep end of my peony ruffles every spring…I’m glad I’m not alone! And I’ll NEVER forget a bouchet of New Zealand peonies a dinner guest brought in December. HUGE blooms. I so enjoy your blog. Thanks for sharing your beautiful peonies. Our California Coast is to mild to grow them. They are amazing. Oh my goodness! Your peonies are fabulous…..not to mention the photos you took. My grandmother grew peonies in her yard and I’ve loved since I was a child!! Thanks for sharing these. They sure ARE worth it! most beautifull photographs…honestly you could have these printed for post cards..
Compliment on the way – got up, wanted eye candy, clicked straight into Trouvais, was NOT disappointed. what lovely flowers, they can really change an interior. I love your picture, always tasteful and beautiful. Here, the weather is improving, so that means more time in my garden, thanks for the inspiration! I can almost smell these luscious peonies. Where are the ants? Those peonies are unbelievable! Mine are still hard little buds. Hopefully soon they’ll be bloomin’! I have some tight buds left…hard to predict with this unseasonably cold weather when they’ll unfurl. I hope everyone posts their shots…the season is way too short. Might have to start cruising florists later this month. I adore your peonies, and they remind me of a lacy stiff petticoat, I had when I was little. Your garden must be a delight to walk around. Many thanks for sharing all the beauty. Love the delicate and pretty chairs. Peonies are the one flower I can’t grow in Southern California that I wish I could; they were abundant in my Grandmother’s garden in Canada….I only have my Yves Piaget roses to substitute…thanks for the lovely photos! i am soooo jealous of your flowers. they are beyond beautiful. you are soooo lucky. YOUR PIONEERS ARE GORGEOUS ! These are exceptional beauties and the pictures are equally stunning. 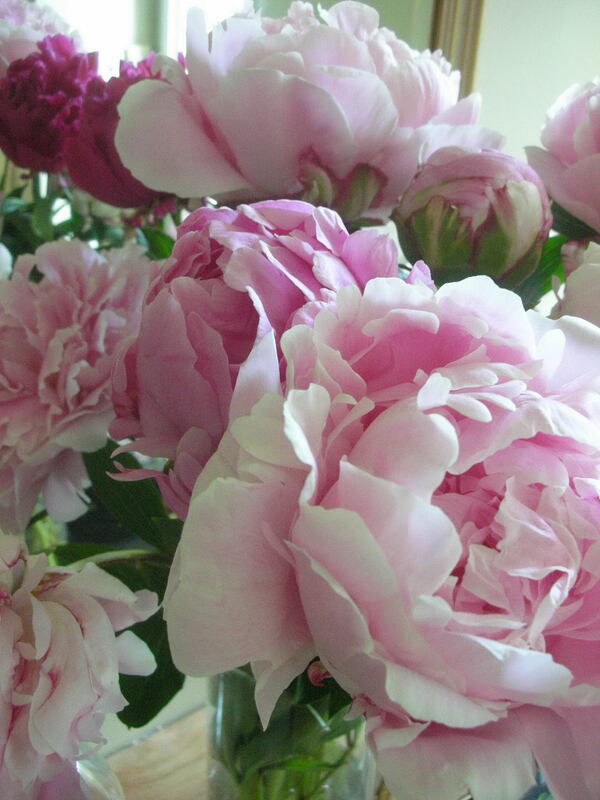 Adore peonies and this round-up is terrific! Thank goodness I did not make it sooner to see your peonies or these truly stunning photos…puts mine to shame and I would have been reluctant to post! I need a better camera and some of your amazing photography skills. I want to make copies of every one of these pictures and hang them from my office walls. Forgive me if I am being redundant just not sure if I pressed the submit button last time and perhaps you have comment moderation enabled. Anyway, your peonies and photography skills are breathtaking!!! I truly wish these were my photos! I have had the most wonderful time browsing through all the blogposts.